Now let's get to the last bit, shall we? which is what you said. And now you all are going to say no to us about one more thing, which is to be able to resolve this conflict that we have through a specific referendum. That, Mrs. Sánchez-Camacho, won't be possible either? I ask you this: are you all, who you represent, disposed, are disposed to finding a legal way, which can be negotiated, so that in Catalonia this very serious conflict can be resolved? Which was not invented by the Government, Mrs. S-C, this is not a conflict that was invented by the Government or, if you will allow me the personal reference, by me. And you all don't understand what is really happening—what is really happening—means that therefore it's impossible to find a good solution. At this point, I am tired of trying to explain in Madrid that what is happening in Catalonia is not a minor thing, that there are many people who have made a mental switch with respect to the Spanish State, they have made a mental switch, and the thought is of disconnecting from the State. And the moment that these mental shifts take place is when great changes occur in society, and that is what is happening in Catalonia. You all can keep saying that whatever you want about what happened on September 11, say whatever you want, go ahead and say that the majority of the country wasn't there, but you must accept one thing: if the majority of the country wasn't there, why don't we resolve the question of whether the majority of the country is in favor of one thing or another by voting? Why don't we resolve it by voting, if you all have doubts about where the majority of the country stands? Yesterday, I explained the whole sequence of events, of three or four years, or five or six, and I'll tell you one last thing: don't look at what happened on the street if you don't want to, you all don't want to look at the street because you don't like what is happening, you don't like seeing 1.6 million people holding hands asking for the independence of Catalonia, you don't like it, I understand that—I understand it—but what I don't understand is something else: what I don't understand is how you're not able to read the results of the elections of November 25 that occurred 10 months ago. I don't understand why that is so hard for you to be able to read. Because that [election] result was very clear, that result gives a very clear majority in favor of the right to decide and to have a referendum—very clear. And you can't suppose that what you and your party represents should be imposed on this wide majority that is next to you. You can't suppose that that which you all defend—legitimately—should take precedence over everything else, because that is not normal, it's not normal. So, stop talking about the silent majority, instead resolve it another way: by voting. A clear referendum. We have given you many methods for doing so, many. There are five legal methods. The only thing that's necessary is political will. And one second thing: a lot of courage in Madrid by those who would suggest it, a lot of courage, lots of courage, I recognize that, they'll have to have a lot of courage. But watch out, because if you don't have the courage to deal with it now, you'll have to deal with it later under different conditions. They'll be peaceful, obviously, and they'll be democratic, obviously, because it couldn't be any other way coming from the Catalan people, it will be democratic and it will peaceful, but it will be. All of the cards are on the table, I haven't hidden anything, and I told you "I am prepared to get to—in order to hold a referendum—to the last possible legal tool that a president has, which is the convocation of elections." I'm not hiding anything, all my cards are on the table. And our attitude is absolutely constructive, because with regard to this majority of the people of Catalonia, it's there, Mrs. S-C, it's there. What's happened has happened, and it's there, this majority is there, and it's very large. Keeping that in mind, the only way to resolve these conflicts in a democracy is by voting. It's what other countries do. When you vote, you either lose or win. Listen, those who now say independence, may go to vote and then lose, or maybe they will win, but that is the risk of a referendum. But, Mrs. S-C, that is the risk of a referendum. Tell us one thing: what is the risk of not having a referendum? Have you asked yourselves that? Change your perspective, change it for one second, I only ask you to take a single moment in this regard, the way the country is feeling right now is not the obsession of the president or of the Government, change your perspective for just a second. Study the costs of not having the referendum, and compare that with the costs—if there are any—of having a referendum. That is how this must be resolved, democratically, there is a majority of the country that wants to radically change the status quo in Catalonia, that wants to go to the extreme that Catalonia become a state, an independent state. That could happen, it could happen and many people are in favor if it. The only way to resolve if that is what will happen or not, is for this referendum to take place, because that is the current that will not change, Mrs. S-C. Not only that, the more negative the position of the institutions of the State against the referendum are, the more it will grow. Because in all democratic and normal civilized countries, when they have problems like these, they resolve these issues by consulting the people. Ignoring the problem will not resolve it, the problem will continue being there. Therefore, grab the bull by the horns, if you'll allow me this expression, an expression translated from Spanish that perhaps you'll like, grabbing the bull by the horns, and understand that beyond speeches about silent majorities and all that, there is a very big problem here, and that problem can be resolved, can be resolved democratically, and you'll have to accept the consequences of the march of time and of the majority will of the people that consider themselves to be a people, who consider themselves to be a nation, who consider themselves to be a society of their own. And in our house, in this Parliament, it is an expression, this people that we're referring to, as I said yesterday, is a mixed people, of quite mixed origins, of languages, of origins of all types, of beliefs, not to mention ideologies, etc. it's a very mixed people, very mixed. And you end end up saying "You are dividing the Catalans." No, Mrs. S-C, do you know what unites Catalans at this moment when there is conflict? And this one cannot be avoided, conflict exists, but that's OK, it's not a violent conflict, it can be a perfectly civilized conflict, it must be a normal conflict, we're in the 21st century, we're in the European Union, we have agreed to a multitude of international agreements about human rights, about whatever you all want. One basic inspiration of the European Union that you made reference to is democracy. Conflict exists, but conflict doesn't mean that this conflict has to get out of hand if we don't make it bigger than it is. 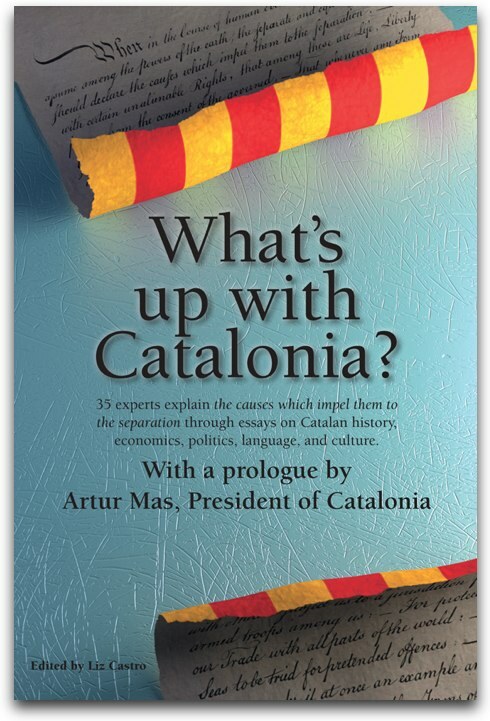 Conflict means that we have to face it, and then what unites Catalans, Mrs. S-C, I believe.